Nintendo 64 cartridges. From left to right; Super Mario 64 (the system's best selling game), the reverse of a USA/Canada, a PAL region, and a Japanese region game, (note the identical tabs near its bottom edge). This is a list of games released solely for a specific console. For related lists of other consoles, see Lists of video games. The Nintendo 64 video game console has a library of games, which were primarily released in plastic ROM cartridges. Two small indentations on the back of each cartridge allows it to connect or pass through the system's cartridge dustcover flaps. All regions have the same connectors, and region-locked cartridges will fit into the other regions' systems by using a cartridge converter or by simply removing the cartridge's casing. However, the systems are also equipped with lockout chips that will only allow them to play their appropriate games. Both Japanese and North American systems have the same NTSC lockout, while Europe has a PAL lockout. A bypass device such as the N64 Passport or the Datel Action Replay can be used to play import titles, but a few games require an additional boot code before they can be played. Of the console's 389 official releases, 196 are region-locked to Japan, 296 to North America, and 242 to Europe. 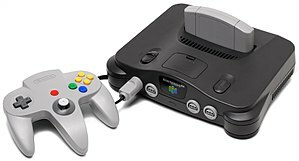 The Nintendo 64 was first launched in Japan on June 23, 1996 with Super Mario 64, Pilotwings 64, and Saikyō Habu Shōgi; in North America with Super Mario 64 and Pilotwings 64; and in Europe with Super Mario 64, Pilotwings 64, Star Wars: Shadows of the Empire, and Turok: Dinosaur Hunter. The last game to be published for the system was the North American-locked Tony Hawk's Pro Skater 3 on August 20, 2002. The best-selling game is Super Mario 64 with 11 million units as of May 21, 2003[update]. Regardless of the higher cost of cartridge production and of continued criticism over releasing a cartridge-based system, the total unit sales of Nintendo 64 software has exceeded the total unit sales of Nintendo GameCube software. The Nintendo 64 library is to date the smallest overall library of game titles on a Nintendo home console. This list does not include games for Nintendo's 64DD disk drive peripheral. The list is initially organized alphabetically by their English titles or their alphabet conversions; however, it is also possible to sort each column individually. It is arranged with the different titles being listed once for each program that it contains; the various titles are listed by the majority name first. In the case of two English regions bearing a game with different names, the first version is listed first. All English titles are listed first, with an alternate title listed afterward; direct translations of English titles are not used. 50 296 North America and other NTSC territories. 3 4 242 PAL/SECAM territories: much of Europe and Australia. 11 85 196 Japan, Hong Kong and other NTSC-J territories. 2018 Eurocom Piko Interactive JP, NA, PAL 3D Platformer Originally to be published by GT Interactive around late 1999 to early 2000 but cancelled. The Nintendo 64 port was published by Piko Interactive in 2018 after being funded through Kickstarter. N/A Interactive Studios Piko Interactive JP, NA, PAL Action/Adventure/Hack and Slash Originally to be published by MGM Interactive but cancelled. The game is planned to be published by Piko Interactive. "Nintendo 64 Games" (PDF). Nintendo of America, Web Archive. Archived from the original (PDF) on March 20, 2007. Retrieved March 20, 2007. ^ Careless, Simon. Gaming Hacks. O'Reilly Media. p. 193. ISBN 0-596-00714-0. ^ Schneider, Peer. "N64 Hardware Guide". IGN. Retrieved 2010-05-09. ^ Maddrell, Alan (July 2001). "How to... Play Import N64 Games". N64 Magazine. Future Publishing. pp. 82–92. ^ Craig Glenday, ed. (2008-03-11). "Hardware: Best-Sellers by Platform". Guinness World Records Gamer's Edition 2008. Guinness World Records. Guinness. p. 50. ISBN 978-1-904994-21-3. ^ Tsang, Rayman. "Nintendo under fire: A history of adversity". Games.net. Archived from the original on December 30, 2010. ^ Buchanan, Levi. "Nintendo 64 Week: Day Two: Sticking with cartridges was a costly decision. For everybody". IGN. Archived from the original on 2011-08-05. Retrieved 2010-05-09. ^ Forster, Winnie. Encyclopedia of Game Machines. Magdalena Gniatczynska. p. 164. ISBN 3-00-015359-4. ^ Kent, Steven L. The Ultimate History of Video Games. pp. 510–511. ^ "Consolidated Sales Transition by Region" (PDF). Nintendo. 2013-07-30. Archived from the original (PDF) on 2013-07-31. Retrieved 2013-07-31. ^ a b c d e "Master Game List". Nintendo. Archived from the original on October 2, 2012. Retrieved April 9, 2015. ^ a b c d e "NINTENDO64全発売ソフト一覧" (in Japanese). Nintendo Co, Ltd. Retrieved April 9, 2015. ^ a b "Total Test". EMAP Limited. November 2000. pp. 46–52. ^ a b "The Awesome Collection, directory". EMAP Limited. April 2002. pp. 54–62. ^ a b c "Nintendo 64 Game List". Game Classification.com. pp. 1–8. Retrieved June 12, 2010. ^ a b "All Nintendo 64 Games". GameSpot. pp. 1–7. Retrieved May 31, 2010. ^ "Nintendo 64 Games". Pwned,LLC. Archived from the original on 2013-02-01. Retrieved 2010-07-01. ^ "ESRB Game Ratings, for Nintendo 64 games". Entertainment Software Rating Board. pp. 1–12. Retrieved May 9, 2010. ^ a b "Nintendo 64, Game Browser". MobyGames. pp. 1–13. Retrieved June 12, 2010. ^ Brown, Andy. "Nintendo 64 PAL Games Checklist, however "NFL Blitz" was not released in PAL format" (PDF). Console Passion Retro Games. Retrieved January 7, 2008. A PAL checklist available for download in PDF format. ^ "Nintendo 64: Game Profiles". IGN. pp. #, A–Z. Archived from the original on July 13, 2011. Retrieved June 12, 2010. ^ "Nintendo 64 Games, by letter and genre". GamFAQs. CBS Interactive. pp. A–Z, #, and genre. Retrieved May 9, 2010. ^ Watts, Martin (2018-02-12). "Cancelled 3D platformer 40 Winks may finally get a physical release 20 years later". N64 Today. Retrieved 2018-02-13. ^ Craddock, Ryan (2019-01-30). "Unreleased N64 Game Dragon Sword Might Finally Be Completed 20 Years Later". Nintendo Life. Retrieved 2019-04-15.